First of all, make sure Adsense is correctly linked to Analytics. To do that, go to Analytics > Admin > select your site > Adsense Linking and follow the instructions displayed there, is the link is not already estabilished. 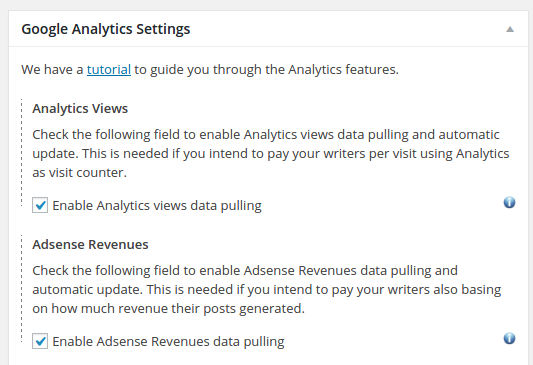 Then head over to Post Pay Counter Options page and make sure Adsense Revenues data pulling is enabled in your installation: head to Google Analytics Settings and look for Adsense Revenues. Make sure the apt checkbox is ticked. Adsense data is taken from your Analytics account, so you’ll have to authorize the plugin to read your data (know how to do that here). After that, Adsense data will automatically be updated with the frequency you specify in the settings (we’re still in the Google Analytics Settings box). If you want to import revenue data for past days, you can do so through the Update data feature in the Google Analytics Status box. Now head to the Counting settings box. After Visits Payment you’ll find Adsense Revenues Payment. If you want to enable this payment type, the apt checkbox needs to be ticked. Please notice that user with custom settings need to have their checkbox ticked as well. You will then be able to insert the percentage of revenues you’d like to share with writers (this can be different from author to author). Remember to save settings at the end of any edits. And that’s how you share Adsense Revenues in WordPress – now revenue data will automatically be updated, and you will be able to pay for them as easily as a click! Have feedback, maybe something could be tweaked to best fit the needs of everybody? Please do write it down below in the comments! Can i have a trial for a month before i buy. Great plugin, but I see one potential problem. The plugin would be using my personal adsense account, and if the author is to receive “x” percent of the adsense revenue, they have an incentive to click the ads on their pages with no threat to them as it is not their Adsense account being used. It would be great it the author could input their adsense account info and decrease the risk of click fraud affecting my personal adsense account. With the Adsense revenue split, is it possible to cap the amount? Say, if I wanted to split up until the author made a certain amount and then revert all future income to my own account? OR, will the plugin allow you to view how much the revenue split is so that you have the ability to simply turn it off per post when it has reached a certain amout? this system or plugin so long ago that we looking for. There is no option for give limit cost of CPM? Which is the page view data from analytichs but the earning from fix or limit % or dynamic number runing everyday by limit. ex : $1 up to $10 / CPM, so they can calculate the best prices from $0.05 per cpm or $1.43 per cpm or $0.19 per cpm, is this plugin can handle this? if they earning data from Google Adsense directly is good, but if from Google Analytics which is Page View only, it’s bad, because we don’t know , how much exactlly the Ads Earning from Adsense Everyday and that was Important. We have a 30-day refund guarantee policy, so if you’d like to purchase the PRO version but are worried it may not suit your needs, I encourage you to go ahead and buy it, and then ask a refund it it doesn’t work the way you need it to. Just a quick question, is the plugin Multisite compatible? Can I share AdSense revenue with sub-blog accounts on WordPress multisite? I would like to ask if this plugin does have or support shortcode? So we can create a page for users in the front-end to see their current unpaid/due earnings and also earnings or view reports. I am making a website where different peopel can post their comics and earn from adsence, donations, selling stuff but since there are so many earing method i cant pay them deirectly. And maybe form their they can withdraw it using using paypal. the plugin does not have any support of the kind, I am afraid. However, we could discuss some custom work implementation to allow you to achieve what you need. If you are interested in this, please fill in the Custom work form to get in touch. When the plugin splits AdSense revenue with author is it total revenue? I mean does it just split the revenue from ad impressions (CPM) or just the ads that visitor click on. Or does it calculate both of these and then split the total with the author? Also, is there a way to set this tool so you only pay out once a minimum payout has been reached. So for example I will pay Authors once their income has reached $10? sorry for the delay, I was on holiday! Or does it calculate both of these and then split the total with the author? Don’t hesitate to ask for more info! I’m starting up a membership site/App like YouTube. I want all my site users to earn from their post visitors or page like in YouTude. Hello, I recently purchased your plugin, mainly for the AdSense share feature. I’m assuming with this plugin, I would also need an AdSense share plugin? And, do you have any AdSense plugins you recommend? I just added a note to the guide. The idea is that authors don’t have to provide their Adsense code, nor they need to even have one. 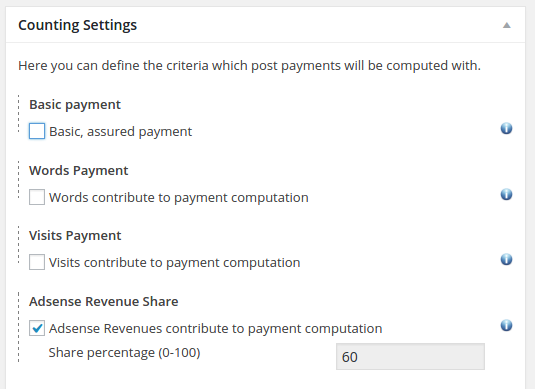 All revenues goes into the site admin (= your) account, and Post Pay Counter will split with the authors the revenue generated only on the posts that they generated. So you just need to place the ads on the site, nothing fancy 🙂 Let me know if you need anything else!